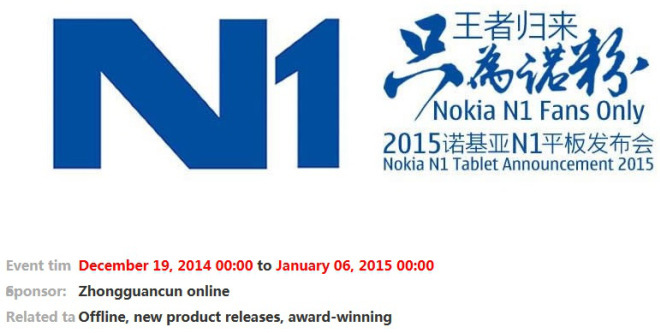 Just a few days after there were reports that Nokia could launch its first Android tablet, the N1, in China on January 7, the company’s social networking channels have confirmed the news. As clear from the image shown above, Nokia is running a contest in the Asian country where participants stand a chance to win 800 tickets and six VIP passes for the Finland-based company’s media event on January 7. Out of them, a total of 24 lucky winners will win the device. Those interested in participating in the contest can register here. Expected to be priced at $249, the Nokia N1 features an Intel Atom Z3580 chipset with a 2.3 GHz quad-core CPU and a 7.9-inch 2,048×1,536 touchscreen. The device has an 8 MP rear camera, a 5 MP front snapper, 2GB of RAM, and 32GB of internal storage. It runs Android 5.0 Lollipop, packs in a 5,300 mAh battery, and is one of first devices to sport a reversible USB connector (Type-C).